Rice is a staple food loved by many Papua New Guineans and despite the Government’s plans to introduce a new quota system for rice, Goodman Fielder International (GFI) PNG yesterday launched its new rice brand Skel RICE which will hit Desh Besh stores, and Boroko Food world in POM next week with a nationwide launch next year. “Skel rice is a medium grain rice and will appeal to many Papua New Guineans as the rice comes in 200grams which costs only K1 and this is what will appeal to many Papua New Guinean’s because it is affordable along with that we have the 500g the 1Kg and the 10kg which we will market in Port Moresby initially with plans later to launch nationwide.” Said GFI National Marketing Manager Jeremy Fry. The medium grain rice is from Vietnam and packaged in Lae Morobe province; however, GFI has long term plans to mill the rice here in the country and despite the government introducing a new rice quote Mr Fry said being a new and small player in the rice industry GFI has nothing to lose and look forward to Papua New Guineans enjoying their rice. Skel rice comes in a bright dark green and yellow that jumps at you and is robust in taste and did well in the blind taste against other rice brands, Skel rice has taken two (2) years of hard work trialled among seven hundred and fifty three (753) people in various parts of the country to come to a product that is unique and individual. “We're expecting to have the maximum retail pricing in the formal retail channels as follows. 200gm: K1 or lower, 500gm: K2.30 or lower 1kg: K4.20 or lower 10kg: 39.90 or lower. Obviously as it goes through various hands the price will increase, but any customer buying it off us will abide by this pricing schedule,” said Fry. 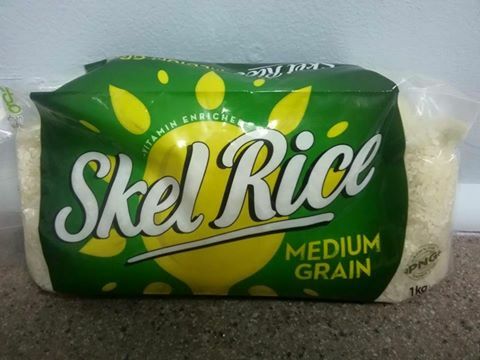 With the Government looking at having competition in the rice market, Skel rice adds a welcome change on the market and leaves the rest to consumers to choose for themselves how well the new Skel rice will do on the market.